Our sequel to the first Alliance/Player vs Alliance/Player event is Back!! There are many things that are similar to the first S.H.I.E.L.D. event but with brand new rewards!! The Iso-8 shards from the original even are back in the same fashion, allowing rewarding the highest valor participant from each alliance with bonus shards. They will be sharable once again, so do not forget to help out in EVERY team battle for the sharing potential. The Trainer Power Pack are also back, and hopefully this time they will actually be awarded with the signin bonus! Make sure you are using your Trainer Power Pack before personal power packs, because these special packs despawn if not used by the end of the event! Alliance members can ‘initiate’ combat, which will allow for the Marvel servers to randomly assign an opponent for those Alliance members to fight. There are a few things you must know prior to engaging the enemy, which will be covered after this section. A battle will not commence without a player initiating it, so make sure to stay active within your Alliance! Winning a battle against an opposing Alliance is done so by gaining more Valor points than the other Alliance before the battle ends. Valor points can be gained by winning a battle against an opposing Alliance member, or by attacking their Protection Walls (you supposedly gain 200% valor if you vanquish an opposing player AFTER their wall has been destroyed). Remember to defeat their DEF leader first so you are allowed to attack other members of their Alliance!! If an opposing member is gaining valor by vanquishing your allies, and you feel that you can beat him, try to focus your efforts on him closer to the end of the battle. Winning against an opponent who has Valor points will reduce his Valor points each time you defeat him by a 20% bonus, so chain your attacks with your alliance for maximum effect! If you are relatively new to the game or the event and don’t have an established powerful deck then don’t be discouraged. Help your Alliance by destroying the walls, and then you can hunt their lower level/strength members down. Remember to always use your Event cards on the Wall, ALL other cards are relatively ineffective. There are also uses for you in the next “specific tactics” section to follow. There are two generally accepted methods for an alliance to take in regards to cracking the opposing team’s DEF Leader. It is VERY important that you and your other members are communicating so that you do not waste any ATK Pwr, or Power Packs going against what the group is attempting to do. If you have a Offense Leader that can destroy the opposing Alliance’s DEF Leader, then their entire group will be opened up to attack and you will have allowed for your fellow members to attack their Leader (granting 20% bonus valor). If you do not have anyone that is able to crack their DEF lead then you will need to coordinate your attacks. If you have a specific deck with at least 50 ATK Pwr and you swing against a DEF Leader and Lose, he still loses 5 DEF Pwr. So if he is attacked 20 or 30 times, he will lose a significant amount of DEF Pwr and should hopefully be low enough such that he can’t equip his best deck. Rally behind your wall bashers. The best tactic is to destroy their wall, wait for their players to initiate combat and gain valor, and THEN attack their players to reduce their valor gains. If you are unable to beat their DEF leader him, then focus your efforts on destroying their wall or coordinating a DEF leader strike your ATK power for the next battle. Keep in mind that you can gain bonus Valor from defeating the opposing Alliance’s Leader (20% bonus) and Officers (10% bonus). Leaders grant the highest bonus, so focus on them if you can win, otherwise pick a target that you know you can win against. Save your power packs for the end of the event or necessary battles, for it will allow you to attack members more often that have Valor: thus reducing their total Valor points. This is also important because if you are being blown out by the opposing Agents, then save your strength for the next battle! And many more S Rares!! There will also be many more rewards from completion bonuses of wins/personal valor points to the ISO-8 Shard rewards, so stay posted for the news!! Feel free to post questions here or in the forum, or just discuss anything you’d like. We’re all excited and we’ll see you in there!! 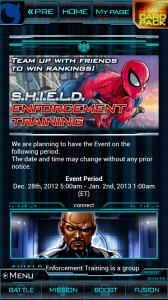 Next story Fantastic Four Raid Event Announced!! 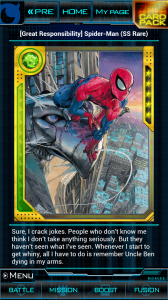 As for the event cards, currently there has not been ANY event cards that were used in more than one event. So if you’re looking to trade that new GR you have for a Professor X (a great trade value wise for you) then I would get that solidified asap!! Feel free to let us know if you need anything, my IGN for WoH and the messaging applications KiK/Line is Kitosumi. We’ll see you in there and have fun!! Hello, I just recently started playing the game, and only really got started just after this event. Thank you for all the information, as I’m sure it will be helpful for future ones. I am curious though, all those protection wall buster cards, do they carry over to each future event? I only ask because somebody showed interest in my [Hell Bike] Ghost Rider, and they have a Professor X card I want, so I was thinking about trading with them, but then saw the bonus Ghost Rider got, and am thinking twice about it.